If you think I am a pacifist, forget it. If you think that the passive advocacy of peace and WorldPeace will accomplish much of anything in this world, you are wrong. Jesus was not passive. Jesus was a revolutionary who actively confronted the hypocrisy of the religious bureaucracy of the Jews. He also confronted the lawyers of his day. He even warned people to settle their differences outside of the courts. Jesus was a man who confronted the two foundations of society, religious bureaucracies and the judicial system. Did Jesus get a fair trial? I think not. I am an advocate for peace but I am not a pacifist. I advocate love, but I have no delusions about the lack of active love in the world society. 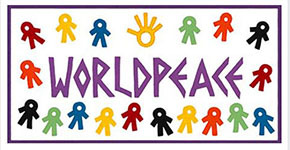 If you have expectations that John WorldPeace is a pacifist in his advocacy of peace and love, think again. Sixteen years ago, I changed my name to WorldPeace. In those sixteen years I have personally experienced the fact that people hate peace. They hate the concept of peace and they fear those who stand up and actively promote it. They give lip service to their religious beliefs while at the same time turning deaf ears and blind eyes away from the pain and suffering which they have the ability to relieve. They love their families and children and tell themselves that other races and nations do not. They refuse to embrace humanity. In fact, people generally believe that those who are not of their religion, race or nation are sub humans to be exploited and ignored in their suffering no matter how great. The last thing the world needs is another passive advocate for peace, love and justice.